We’d love your help. Let us know what’s wrong with this preview of Parenting in the Age of Attention Snatchers by Lucy Jo Palladino. Are your kids unable to step away from the screens? Here is a practical, step-by-step guide that gives parents the tools to teach children, from toddlers to teens, how to gain control of their technology use. As children spend more of their time on tablets and smartphones, using apps specially engineered to capture their attention, parents are concerned about the effects Are your kids unable to step away from the screens? Here is a practical, step-by-step guide that gives parents the tools to teach children, from toddlers to teens, how to gain control of their technology use. As children spend more of their time on tablets and smartphones, using apps specially engineered to capture their attention, parents are concerned about the effects of so much technology use--and feel powerless to intervene. They want their kids to be competent and competitive in their use of technology, but they also want to prevent the attention problems that can develop from overuse. Lucy Jo Palladino shows that the key is to help kids build awareness and control over their own attention, and in this guide she gives parents the tools to do exactly that, in seven straightforward, evidence-based steps. To ask other readers questions about Parenting in the Age of Attention Snatchers, please sign up. Okay, if you don't have kids, work with them, or care for them, you can probably skip this one. But, if you have children living with you or you work with children, then you need to read this book. Technology, gaming, and social media are here and we can't realistically avoid them. But it's hard to know the benefits and pitfalls and if it's hard for adults, imagine the difficulty for children, and that includes teens, whose brains are quite literally still developing. This book is n Buy this book! This book is not my usual fare for the blog but I saw it at NetGalley and had to have it. I hoped that, despite its emphasis on the family, I would find it useful as a teacher. Happily, I did. 1) The advice and information is firmly grounded in science and research. Numerous studies are cited as are YouTube videos (apropos, no?) but we also get anecdotes from the author's work with children of all ages as well as visits to classrooms. 2) Palladino, the author, has a calm, sane, reasonable approach. There's no 'the sky is falling' nonsense. She accepts that computers, gaming, social media, etc. are here and it's the job of adults to help children learn how to manage their time and to make responsible decisions concerning technology. 3) I learned, a lot. Any book that teaches me something is a good one and this had a lot. The information about voluntary and involuntary attention alone was a mix of new and familiar. Add in the information about how computers affect the brain and its development and I have a lot to think about. 4) The advice and suggestions, while definitely aimed at families as the title says, are easily adaptable to classrooms, camps, and other environments where children of all ages spend time. 5) She respects the children. That alone is huge. Too many of the books I read, aimed at parents, show a distinct lack of respect for children. They try to 'fix' the child or address the child's issues only from the parental perspective. Palladino neatly navigates the tricky balance between the child's needs and the family's needs. While most of the advice given is to help the child, some of the advice she presents is aimed at the parents, to help them cope. 6) This is related to number one. Palladino clearly understands child development and it underpins her advice. Suggestions given are not one size fits all but each one is broken down by age, how to make it applicable and relevant to the different ages and stages. 1) A few statements and examples lacked context. For instance, she talks about a father trying to engage his son in interests other than gaming but disregards, initially, the son's interest in drumming. He, the father, stated that he'd noticed his son tapping along to music but thought it was a nervous habit. That confused the heck out of me because tapping along to music is both normal and common. Palladino provided no context as to why the father though this was abnormal behavior. I read it and thought the problem lay with the father and not the son; context was seriously needed. 2) Occasionally the text was dry but that had more to do with the science than Palladino's style. Overall, her style was easy, clear, and witty. Buy it, read it, use it. I'm encouraging my school to buy this book and use it. I think it would not only be educational for the other staff but a good foundation for developing an official technology policy. If you're a parent, teacher, guidance counselor, etc. I can not recommend this book enough. 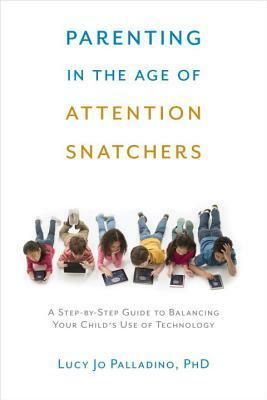 Lucy Jo Palladino's book, Parenting in the Age of Attention Snatchers: A Step-by-Step Guide to Balancing Your Child's Use of Technology is a timely contribution to parenting in the 21st Century. An update version of the classical Marshmallow Experiment, the technology devices of today are magnets to the Involuntary Attention of kids and teens (and adults). Palladino complements the traditional research about willpower with modern results in neuroscience. The limbic (primitive) system arm wrestli Lucy Jo Palladino's book, Parenting in the Age of Attention Snatchers: A Step-by-Step Guide to Balancing Your Child's Use of Technology is a timely contribution to parenting in the 21st Century. An update version of the classical Marshmallow Experiment, the technology devices of today are magnets to the Involuntary Attention of kids and teens (and adults). Palladino complements the traditional research about willpower with modern results in neuroscience. The limbic (primitive) system arm wrestling with the modern man's prefrontal cortex that develops during puberty and adolescence. As a parent struggling with two kids of this age Palladino's work seems like a great tool (yet to put into practice). It gives perspective and ideas on how to help the children learn how to get the advantage of technology while they learn to self control, to use their Voluntary Attention. As Palladino says "Your child's ability to use an off button is quite possibly the most important technological competency she can learn". For parents the book has two gifts. First it emphasizes the importance of the relationship between parents and children. Nothing is more important than a good relationship among them and many times our effort to reduce the abuse of electronics ends up deteriorating the relationship. Second it puts the finger on the responsibility of the parents. Often we feel offended by the responses from our kids without acknowledging our contribution to the problem. Beginning with using e-nannies to giving a bad example with our own habits and not being able to separate the action from the agent. The seven step guide begins with an parent autoevaluation and as it goes helps us focus on priorities, changes of midsets, challenges, and results. Even though Palladino takes the parent back in the arena, it reduces the stress of the job by clearing expectations and giving tools to kindly cope with the frustration of setbacks while patiently celebrate the results. As adults we have a great deal to offer our kids. Since our mental abilities are fully developed Palladino suggest for instance asking the right questions and providing the metacognition necessary to understand the big picture and long term implications of our actions. Additional resources like the American Academy of Pediatrics Media Life Plan recommendations and references to more in depth studies enhance the toolkit provided by the book. Technology is part of our lives, having the tools to focus and use them wisely is a challenge for all, but specially for kids who are learning to use their prefrontal cortex. In the past attention snatchers were less exuberant but the plain mind-wondering has always existed. Our evolutionary drag is a challenge for modern world, and electronics are just a new struggle field. Parenting in the Age of Attention Snatchers is a workbook to help our kids be successful adults and us happy parents. This book is the first and only evidence-based approach I have seen that helps parents decide how to balance to use of technology with the reality of how a child’s brain develops. Technology is here to stay – but how do we make sure our kids still develop the important skill of deliberate, sustained attention? They need our help to learn to use technology effectively, rather than be victims of it. Thank goodness for Dr. Palladino’s real-life examples and tools for parents, based on the most cutt This book is the first and only evidence-based approach I have seen that helps parents decide how to balance to use of technology with the reality of how a child’s brain develops. Technology is here to stay – but how do we make sure our kids still develop the important skill of deliberate, sustained attention? They need our help to learn to use technology effectively, rather than be victims of it. Thank goodness for Dr. Palladino’s real-life examples and tools for parents, based on the most cutting edge understanding of the brain that science has to offer, written in readable, engaging style. Her balanced approach gives me hope, and also gives me something solid to recommend to my patients. Important info to consider in this age of technology, screens, and constant distractions. I not only found this book helpful in parenting but also in my own use of technology. "التربية في زمن سارقي الانتباه"
I thought this book was a great simple approach to working with kiddos who have a dependency on their technology. The writing was easily digestible, the language was fun, and the advice seemed reasonable. Take your time and pay attention to this book. Helpful information presented in a straight forward way. I recommend this book for parents. very insightful thoughts on the role of distractions in modern life. I appreciated that these were not demonized but that they need to be understood to be managed. This was insightful and offered many good tips but did not give me the specific guidelines that I was looking for. I'm a psychologist, author, educator, and blogger with a special interest in attention and neuroscience, My newest book is Parenting in the Age of Attention Snatchers (2015). Before that, I wrote Find Your Focus Zone (2007). My first book, Dreamers, Discoverers and Dynamos, was published in 1997 as a hardcover titled The Edison Trait. I'm grateful to my readers for supporting my work through the y I'm a psychologist, author, educator, and blogger with a special interest in attention and neuroscience, My newest book is Parenting in the Age of Attention Snatchers (2015). Before that, I wrote Find Your Focus Zone (2007). My first book, Dreamers, Discoverers and Dynamos, was published in 1997 as a hardcover titled The Edison Trait. I'm grateful to my readers for supporting my work through the years. As a child, I constantly had my nose in a book. After graduating from Fordham, I taught school in NYC, then moved West to Arizona State University for my PhD. I completed my internship in psychology at Parkland Memorial Hospital in Dallas, Texas, joined the clinical faculty at the University of Arizona, and served as principal investigator for a federal research grant in Tucson, AZ. In 1986, I moved to San Diego, CA. I've had a clinical practice for 35 years. Currently, I counsel parents and families in Encinitas, CA, teach professional development, give talks and workshops, and blog at http://lucyjopalladino.com.